Microsoft's infamous blue screen of death could be getting a new look in the company's upcoming Windows 8 operating system; it's going black. 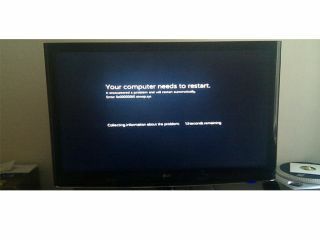 A sneaky photo of one of the latest builds of the OS reveal the system error messages on a black screen, with that dreaded message "Your computer needs to restart". We dread to think how many millions of irreplaceable words, tricky lines of code and billions of edited pixels have been lost to the blue screen of death over the years, yet it has become somewhat of a legend as its occurrences become increasingly rare. Encountering a blue screen of death joins the Xbox's red ring of death as an unpleasant but somehow fondly-remembered event. The change may not be a permanent one, however, as WinRumors points out; Microsoft has switched to black screens of death in builds of other Windows OSes and always ends up back at blue. At least we can keep the BSOD initialism going, no matter what the colour. We'll find out this essential information for sure when Windows 8 is revealed, probably this autumn.